A new initiative promises to accelerate engagement of the urban community in climate action, building on the synergy of sustainable urbanization and low-emission, resilient development. In the critical year for the implementation of the New Urban Agenda and the Paris Agreement, local and other regional leaders are inviting national governments to a series of dialogues designed to strengthen national climate plans. 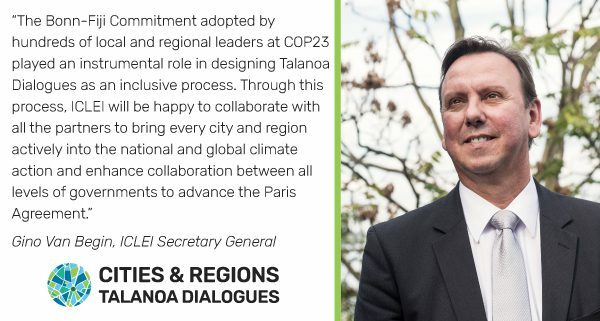 The “Cities and Regions Talanoa Dialogues”, facilitated by ICLEI – Local Governments for Sustainability with Global Covenant of Mayors for Climate & Energy and UN-Habitat as special partners, are expected to take place in around 40 countries worldwide – representing half of the world’s population — as part of a wider, global exercise called Talanoa Dialogue. The initiative was presented February 9 at the 9th World Urban Forum in Kuala Lumpur. The initiative also follows a Call for Vertical Integration of Local Authorities in national climate investment plans issued by the Global Covenant of Mayors at the One Planet Summit last December. Spearheaded by Mayor of Quito Mauricio Rodas, in collaboration with the Mayors of Buenos Aires, Medellin, Mexico City and Sevilla, the effort underlines the need to provide pathways for active participation and engagement of sub-national governments in the formulation of national climate investment plans in line with the Paris Agreement (NDC Investment Plans) and accelerated tracks for sub-sovereign financing for Latin American cities. The Talanoa Dialogue is viewed as a major global push to bring more stakeholder engagement on board towards achieving the 1.5-degree target in the 2015 Paris Agreement. Talanoa is a traditional word used in Fiji to describe an inclusive and transparent dialogue and decision-making process. greenhouse gas emissions and they are among the most vulnerable hotspots for climate change impacts. Current commitments by local and regional governments have the potential to reduce emissions by 5-15 gigatons by 2020 to 2030. However, only around 60% countries have some sort of urban perspective in their national plans, according to UN Habitat figures. ICLEI – lead of the Local Governments and Municipal Authorities Constituency at UN climate negotiations and on behalf of the Global Task Force of Local and Regional Governments — and partners are taking the initiative, with a view to delivering and advancing national climate plans through effective multilevel governance, a vision shared in spirit by the New Urban Agenda adopted in 2016. The year-round process is expected to take place in around 40 countries with the engagement of more than 15 networks and partners of local and regional governments. The dialogues will enable a more active engagement of ministries of urbanization, housing, public works, or their equivalent as appropriate, who have not been as adequately involved in the national and global climate efforts so far. This entry was posted in CityTalk USA and tagged climate action, COP23, COP24, local governments, UNFCCC. Bookmark the permalink.